In a series of recent articles in the Atlantic, columnist and author Ta-Nehisi Coates criticized US presidential candidate and self-described socialist Bernie Sanders for not supporting reparations. Cedric Johnson responded with an open letter that challenged Coates’s worldview, and suggested that Coates is operating as part of a black managerial elite whose calls for reparations and critiques of redistributive social programs are really about carving out their piece of the American capitalist pie. There is a lot at stake in this debate — much more than whether Bernie Sanders cares about black people or whether we should support him as a candidate. The more important issue is how the Left views the relationship between racist oppression and the exploitation of the working class. And in this respect, Sanders, Coates, and Johnson all get it wrong. I think socialists should absolutely support the call for reparations for people of African descent in the United States (and elsewhere). Sanders was wrong to dismiss the issue, and Coates erroneously concluded from Sanders’s position that socialists necessarily adopt a reductionist, “class first” politics. Coates’s error was then confounded by Johnson’s argument, which counterposed the call for reparations to the fight for social-democratic redistributive policies — as if the two couldn’t, or shouldn’t, be part of the same struggle. Socialists should favor reparations for black people as part of a broader movement to redistribute wealth and power to all people who are oppressed and exploited under capitalism. Black people have been robbed specifically and continuously in this country. As Coates points out, systematic racist plunder is not something that only happened four hundred years ago. It’s the whole story of the twentieth century — and, despite the election of the first black president, it’s marked the twenty-first century, too. The subprime mortgage crisis of 2008 was the single greatest destroyer of black people’s wealth in US history. The banks got paid, and black people (disproportionately) got robbed. On this much, I assume, Coates, Johnson, and Sanders agree. Other people in this country were — and continue to be — robbed as well: the indigenous people of North America whose land and lives were stolen; the Chinese immigrants whose broken backs built railroads; the European immigrants who suffocated in mines; and many others. 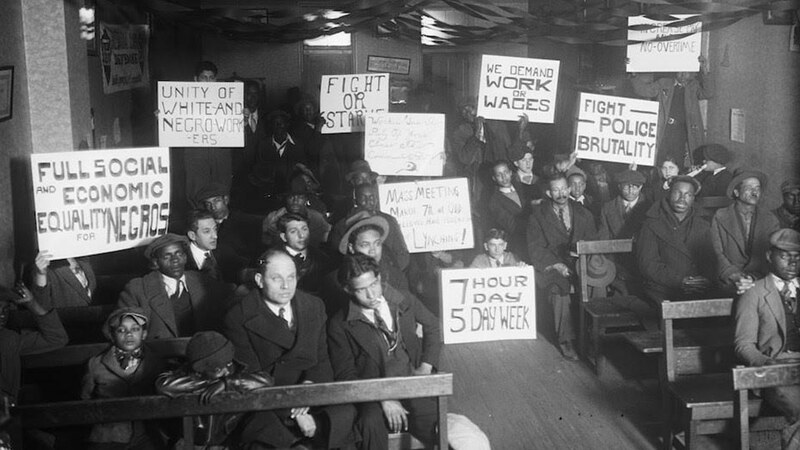 Throughout US history, when these workers rose up and fought for dignity, better pay, safer conditions, and fewer hours, they were met with organized violence, terror, and even murder. Every great fortune was built with blood. While the ideology of “white supremacy” was necessary to justify this systematic plunder, it served to mask all exploitation and oppression. Racism was not created for its own sake. It’s long been wielded to divide the laboring population. Coates points to large disparities in wealth and other indices of white and black life, arguing: “This is not a class divide, but a racist divide.” But in setting these categories against each other, he fails to appreciate their profound entanglement. If there weren’t large gaps between white people and black people — e.g., material and wealth disparities — racism would not be effective. Racism explains these differences, but the ideology of race also prevents us from noticing that most people’s net worth is falling. Coates, however, concludes that racial identification is more powerful than class identity. “In America,” he writes, “solidarity among laborers is not the only kind of solidarity,” and furthermore, “it isn’t even the most potent kind.” Coates is correct, of course, that working-class solidarity is not usually the “most potent” kind of solidarity. If that were true, capitalism would be in big trouble. If racism has been essential to disrupting class solidarity, it isn’t permanent, unchanging, or uncontested. Because racism is central to the operation of capitalism, antiracism must be central to any movement that hopes to challenge it. As Coates rightly notes, racism has systematically hampered even strong left movements trying to win reform in the United States. Therefore, the specific legacy of racism in the US must be addressed if we are to have any hope of winning the kinds of progressive legislation Bernie Sanders is proposing. Black people, Johnson correctly points out, have historically been at the core of efforts to secure such a program. The American Communist Party’s flawed-but-heroic attempts to meld these issues is probably the best example of a mass movement in the US guided by the idea that fighting racism is central to fighting for socialism. Likewise, instead of counterposing these agendas, we should fuse them. We need to push for wealth redistribution on a vast scale and insist that such an effort attack the legacy of racism. Doing one without the other is a recipe for disaster. We can even go a step further. As Marx argued, all profit is theft — if workers were paid the full value of their labor, there would be no profit. Reparations therefore must be targeted at the class of people who benefit from this theft. Walmart is a clear example. The largest private employer in the country (and, as it happens, the largest employer of black people in the US), the company pays its full-time workers so little that many qualify for public assistance. Through the decades, Walmart’s owners have piled up billions by exploiting low-wage labor. It’s the Walton family who should pay reparations — not Walmart’s white workers, who are scraping by on public assistance. Indeed, understanding the class nature of our society is essential to thinking through the reparations issue. Most discussions about reparations are emphatically not about taxing every white person in order to cut a check to every black person. However, there are entities — banks, insurance companies, and the federal government — that have accumulated vast sums through the systematic exploitation of black people over many years. These organizations, corporations, universities, and, in some cases, individuals, are sitting on piles of cash and should pay up. It’s also worth remembering that nowadays, some of the people sitting on top of these fortunes (or helping manage them) are black. There is a small but growing class of black elites who will never support reparations — or any politics of genuine wealth redistribution — because it is not in their material interest to do so. The bottom line is, the very concept of reparations for people of African descent is dangerous to the American ruling class. Grappling with the real legacy of white supremacy would explode the lies America tells about itself (from “meritocracy” myths to “culture of poverty” arguments). And, equally important, a serious debate over reparations would raise dangerous questions about where wealth comes from and about who is owed what in this country. Socialists should argue that black people are owed quite a bit — and that other people are owed too. If black people should receive remuneration because they were robbed, shouldn’t banks and major corporations be responsible for compensating everyone they’ve abused and exploited? If the source of all profit is labor, then isn’t the entire American working class being shortchanged? The kind of redistribution Bernie Sanders is talking about falls far short of what Marx advocated: the genuine democratic control over our working lives. It also falls short of what is needed to truly end poverty in the US. But Sanders’s proposals do threaten America’s elite, because they would shift the balance of power toward labor and away from capital. If there was no such thing as health care bills or college tuition, and if every job paid at least $15 an hour, working-class people in general — and black people, in particular — would be in a much stronger position to speak up, organize, and fight for everything that we are collectively owed. Coates is wrong that Sanders’s program represents the same kind of “rising tide lifts all boats” approach that Obama adopted. Obama has been a neoliberal president from the beginning; his policies have shifted the balance of power in favor of capital. For example, Obama’s support for privatizing public education and crippling teachers unions has had a disproportionately negative impact on black teachers, and has been a harbinger of further attacks on one of the last bastions of black people’s wealth — public sector unions. Bernie Sanders, in contrast, is bringing the word “socialism” back into the mainstream and raising the idea that America needs a more equitable distribution of wealth. Those are good things. Unfortunately, he is doing so inside a party whose goals are the complete opposite. Whether or not he prevails, I hope a new generation of people rediscovers the socialist tradition. We desperately need a mass socialist party in this country. But the Democrats are never going to be that party — we’ll have to build our own. The reparations discussion is reemerging now because a new movement of black people fighting state-sponsored violence is taking shape nationwide. This new movement is already rediscovering the brilliant work of black socialists like W. E. B. Du Bois, C. L. R. James, Angela Davis, and many others. They teach us that the struggle against racism and the struggle against capitalism are inseparable — and that we will never defeat one without tearing down the other.